Unless you’d been hiding under a rock for 2012, you’d be considered a bit “off the heat” pop-culture wise if you’d not heard of these hot potatoes – they have been splashed all over the music press and squeezed through the airwaves a whole lot since being picked by Jack White to support him on an extensive tour… they are sizzling! 1. go to Brighton’s late license watering hole, The Green Door Store, expecting nothing but a couple of pints, a nod and hello from one or two of the usual suspect night-owls and maybe a foot-tapping tune …receive from bar manager a backstage pass to End Of The Road Festival (on at that very moment, that very weekend) wow! 3. arrive, see good friends Nick “The Switch” Rhodes and Kai, bop about to Graham Coxon and then (with a touch of Dutch courage) try out the backstage pass at the Big Top stage. 4. make it backstage, watch Deer Tick from the wings, try to locate backstage hospitality bar – strut straight into Alabama Shakes dressing room like a total intruding fool! 5. brainfizz! red cheeks and optimistic opportunism! chat to tour manager hurriedly about postermaking, swap emails, retreat sheepishly and apologetically. 6. enjoy 3 sets of varying power and intimacy by the Shakes – oh and hang out briefly with Patrick Watson at the Piano Stage (amazing fun) …do other stuff till festival close – go home. 8. amble a little disappointed, but still kinda buzzy from the gig, to The Green Door Store again, this time bumping into a rather drunk, good-for-little friend “Scottish Rob” on the way. 9. have a drink and laugh for a bit (the place is empty) till bizarrely, yup, the Alabama Shakes and tour manager stroll in! 10. Show the band the portfolio finally and get the go ahead, all the while amused but somewhat anxious about Scottish Rob swinging singer Brittany about dangerously on the cobblestone dancefloor (he really was hammered). So there you go – that’s what it takes sometimes, a bizarre chain of stupid drunken coincidences and some barefaced cheek! Anyhow – do email us (pzprints@gmail.com) if you’d like to pick one of these up – just £20 each until we get down to our last few (+p&p). 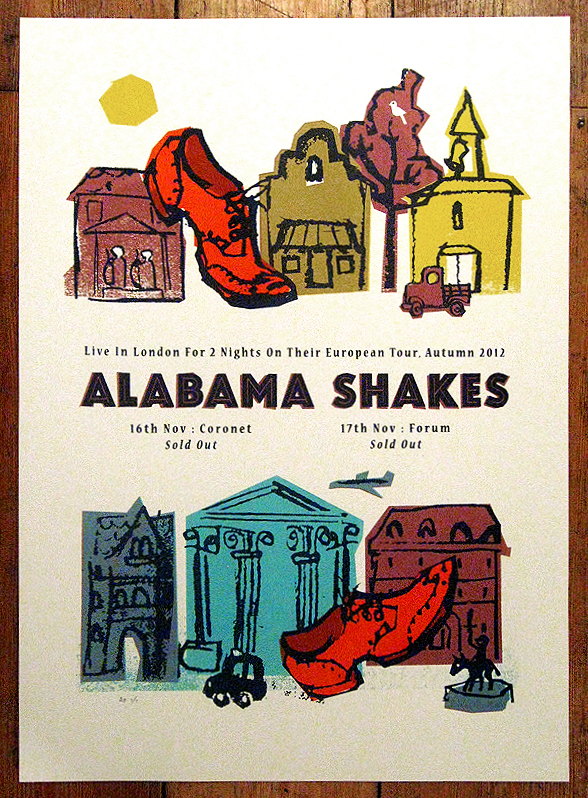 This entry was posted in Festivals, Gigposters, Screenprints and tagged affordable art, alabama shakes, art, bestival, Brighton, collectables, Concorde 2, end of the road, festival, gig, gigposter, illustration, jack white, Kai, limited edition, London, Nick Rhodes, patrick watson, petting zoo, poster, print, rock n roll, screenprint, serigraphy, the green door store. Bookmark the permalink.